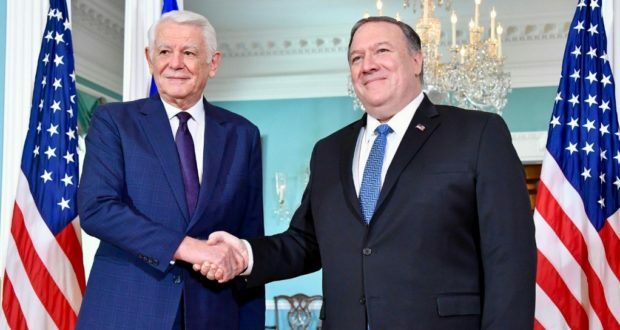 US Secretary of State Michael R. Pompeo has met Romanian Foreign Minister Teodor Melescanu in Washington, DC, on Monday. Pompeo told Melescanu about the important of fighting against corruption “that undermines the democratic institutions”. “They discussed our close security cooperation with Romania, a stalwart NATO Ally meeting its defense burden-sharing commitments, and the challenges facing NATO on its eastern flank. They specifically spoke about Russian aggression in the Black Sea and Romania’s role in contributing to the security and stability of the Black Sea region. They also discussed the importance of Romania’s efforts to counter corruption that undermines its democratic institutions and promotes adversaries’ malign influence,” reads a statement by Deputy Spokesperson Robert Palladino released on the US Department of State website. In the press release issued by the Romanian Foreign Ministry, there is no mention about the corruption topic, it is said that the discussions referred only t o security issues. “FM Teodor Melecanu has appreciated the tight partnership with the U.S. on security, emphasizing Romania’s and the Romanian-American cooperation’s strategic role in providing an integrated approach of the defence measures on NATO’s Eastern flank. At the same time, the head of the Romanian diplomacy has underlined the importance of enhancing the US and allied commitment for the security of the Black Sea region“, reads MAE press release.